Discussion in 'Freezone, Independents, and Other Flavors of Scien' started by CommunicatorIC, Jan 15, 2019. Independent Reformed Church of Scientology incorporated in California. 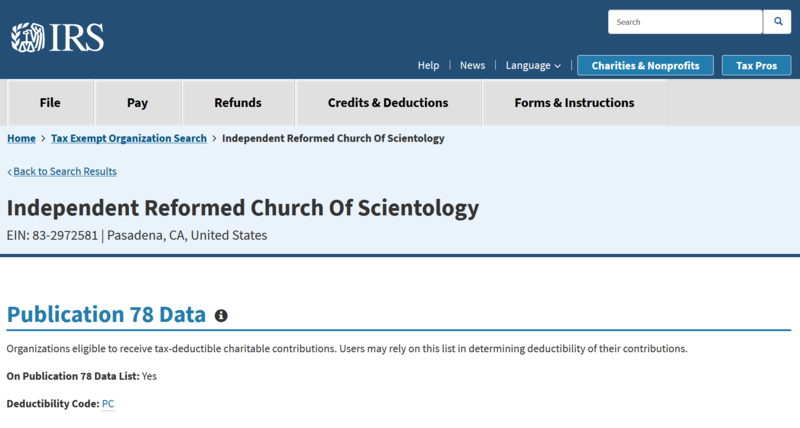 A search of IRS Select Check shows the Independent Reformed Church of Scientology does not yet have U.S. tax-exempt status. 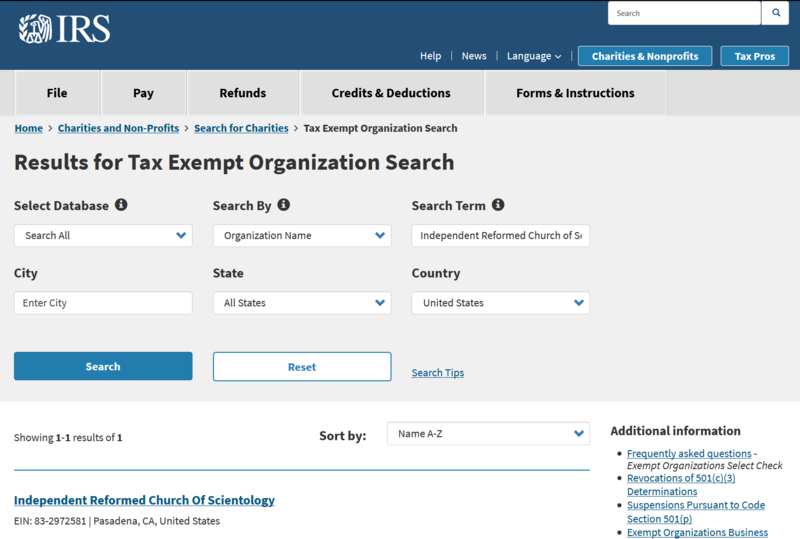 A search of the California Exempt Organizations List shows the Independent Reformed Church of Scientology does not yet have tax-exempt status in California,. It actually looks quite nice. The Independent Reformed Church of Scientology is now live. PS. Thank you and hats off to Merrell Vannier for being instrumental in helping us achieve this. 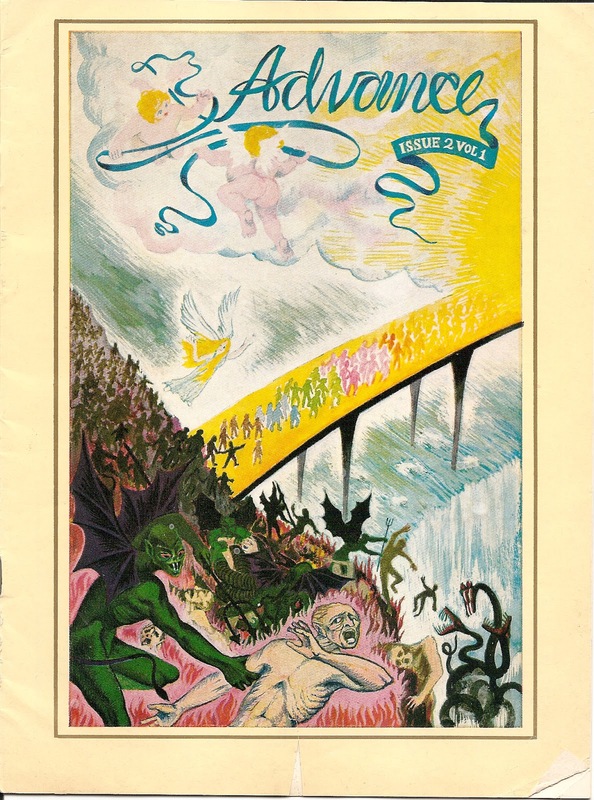 You will recall that Merrell Vannier is one of the people behind both the [Independent Scientology] Religious Liberty League (RLL) and the First Independent Church of Scientology (FICS). The FICS is as of this writing still in administrative litigation with the Church of Scientology International over the FICS applications for trademarks. 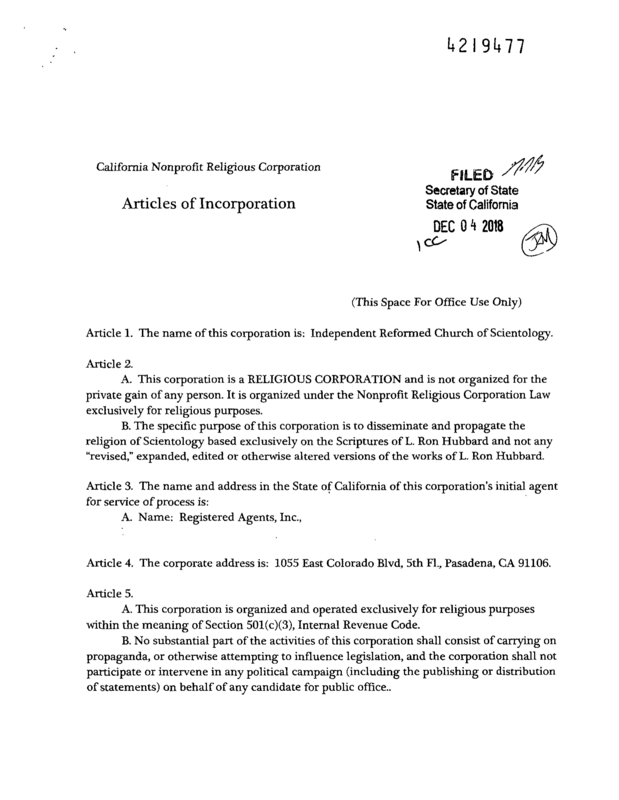 Note the address listed on the Independent Reformed Church of Scientology web page, 1055 East Colorado, Pasadena, CA, is the same address listed in the California Articles of Incorporation and the official California corporation business search result in the first post in this thread. "Board members at this time are Lana Mitchell, Mike Eldredge and Chris Black." Our organisation is global. It provides support, training, materials, guidance, promotion, marketing, correction and help. It has no fixed location but organises delivery of auditing and training across the planet through associates who do train and audit. There are no tithes or fees as part of this Church. It is a network of Scientologists, working with a common purpose, applying standard LRH technology to train auditors and take people to Clear and OT. It is early days, but we have thousands of Scientologists around this planet who have the right to standardly practice their religion in a safe environment. All are welcome. 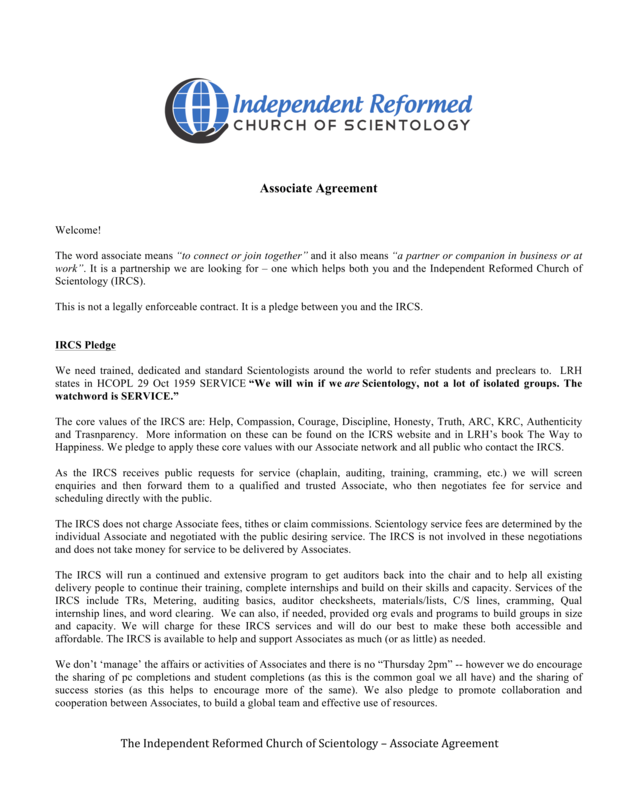 "[T]he Independent Reformed Church of Scientology) is hereby extending a complete General Amnesty to all Scientologists who have been penalized before this date, by any Scientology group, person or entity." Pierrot Bartnik: Class VIII, Class IX Auditor. Repairs, case cracking, handling of any level and rundown to EP. Available to travel to deliver. The Delivery Associate Agreement is below. Reading this, and the comments from those at Milestone Two, it appears that nothing has been learned from the events and revelations of the last forty years. Expressing exclamations and Hubbardisms, they're excited about recreating Scientology as it was before Miscavige. That's their idea of "reform." I bet they don't deliver auditing/training/cramming/CSing at that address. 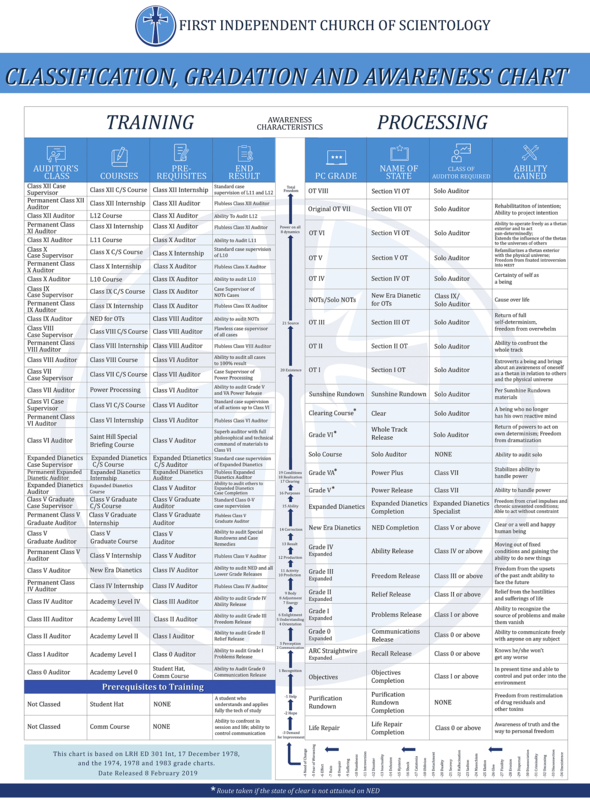 The Independent Reformed Church of Scientology (IRCS) has produced a Grade Chart. It appears the Grade Chart of the Independent Reformed Church of Scientology (IRCS), above, is identical to the Grade Chart of the First Independent Church of Scientology (FICS), below. It appears the Grade Chart of the Independent Reformed Church of Scientology (IRCS), above, is identical to the Grade Chart of the First Independent Church of Scientology, below. This, at least, is a Grade Chart with the old fun (recycled Rosicrucianism) upper OT levels, which sounded so neat but no one could actually do, beyond some quirky psychic accident, or their imagination, or "I thought my phone would ring and it did!" confirmation bias. It's good to the extent that it might draw some people out of Scientology Inc. - who have secretly yearned to do these old upper OT levels. The idea is that the CIA and/or Markabians took over Scientology to prevent people from doing these upper levels. I see the middle Grade Chart is still mangled on these charts. What do they do with "Dianetic Clears" who never ran the Clearing Course (implants) when they finally do (old) OT 4 where one mocks up and then unmocks the Clearing Course implants? (To ensure that one is resistant to any possible future evil extraterrestrial implanting). Do they tell them they'll never have "certainty of self as a being"? and not to worry about it, and just skip (old) OT 4? Come to think of it that shouldn't be a problem since "Dianetic Clears" have already made their peace with never having the other EPs of the middle Grade Chart over which they skipped. But what do they do with NOTs completions who still have somatics?, and who can't actually do the OT actions that NOTs plus the old upper OT levels were supposed to make possible? Or is that unimportant if some were coaxed off the Scientology Inc. hamster wheel into the less restrictive milieu of reformed Scientology? where there's a greater chance that they might, eventually, move beyond Scientology itself? 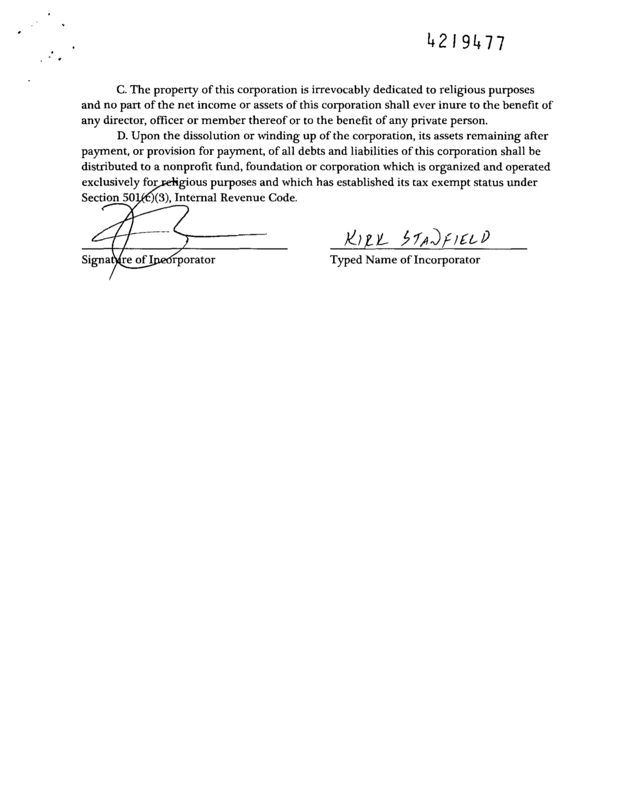 IRS Select Check now shows the Independent Reformed Church of Scientology has obtained 501(c)(3) tax-exempt status in the U.S. 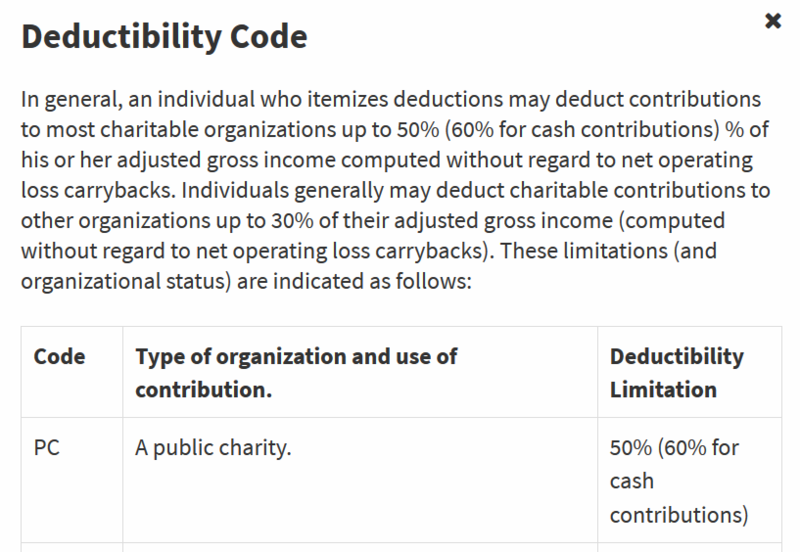 So the Independent Reformed Church of Scientology has obtained 501(c)(3) tax-exempt status in the U.S. How that worked with the cult was that public paying any official CofS entity got to deduct their "charitable donations" <spit>, at least in the US. But surely that won't work the same with some indie US Scnist out in the wild paying his local service provider for "original LRH auditing"? I don't see how the IRS can classify this group...(or the Cult?) as a "Public Charity." 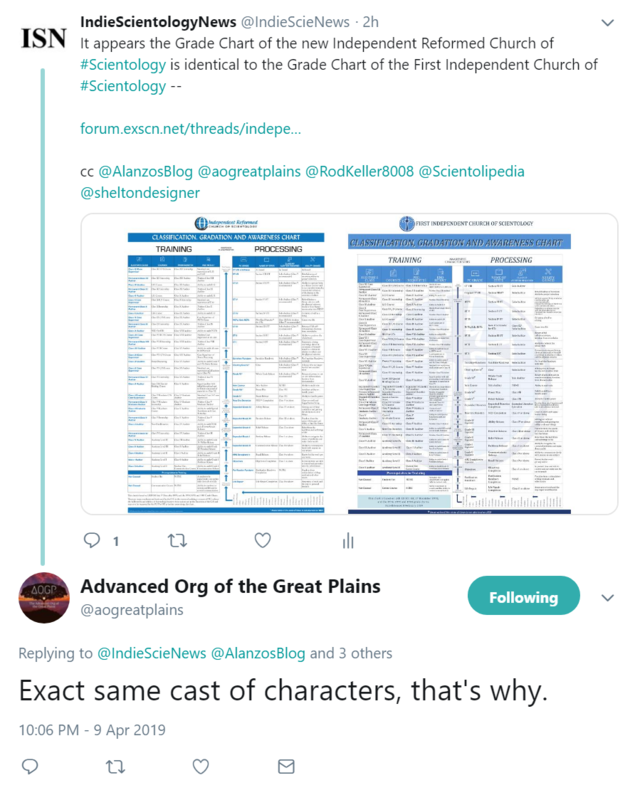 The Independent Scientology Advanced Organization of the Great Plains has replied to me on Twitter about the Independent Reform Church of Scientology. Lana Mitchell has explained the need for the new Independent Reformed Church of Scientology given the prior existence of the First Independent Church of Scientology. At the end of 2017 the First Independent Church of Scientology was registered by Jim Fonda, and I got excited that there was a possibility to create a ‘second terminal’ to break the monopoly and suppressive hold that the Church of Scientology has on the field. I was hopeful that we had another opportunity to connect up the field and get standard Scientology delivery occurring. Despite the continued noise in the media, we can help people recover from what has occurred and I liken it to the fall-out after a major cataclysm or war. There are people out there, thousands of them, that need assistance, and by using standard tech we can bring relief and work to try and sort out this mess. Unfortunately Jim Fonda, despite the best of intentions, has a different plan for the First Independent Church of Scientology which is focused more on a Div 6 public, so the new church has not progressed as I would have hoped and it does not fill the much needed gap within the field to create a new 3rd dynamic group. So that brings us to present time. A long 10-year story — but really only a snippet of time in the time-track of us eternal beings. We have pockets of delivery happening all over this planet. There are many well-intentioned, honest, hard-working and sincere Scientologists who are delivering Scientology in the field. There are a handful of loopy squirrels and one or two criminal rip-off merchants, but the majority are on the rails and just doing what they love – moving people up LRH’s Bridge. Tom Martiniano, Chris Black, Ingrid Smith, Mike Eldredge, Pierrot Bartnik, Becky Buchanan, Carolyn Groff and many more – these are good people doing good things. There is a plan to try and create a new 3rd dynamic again – and if that fails, we will try again, and if that fails, we will try again. 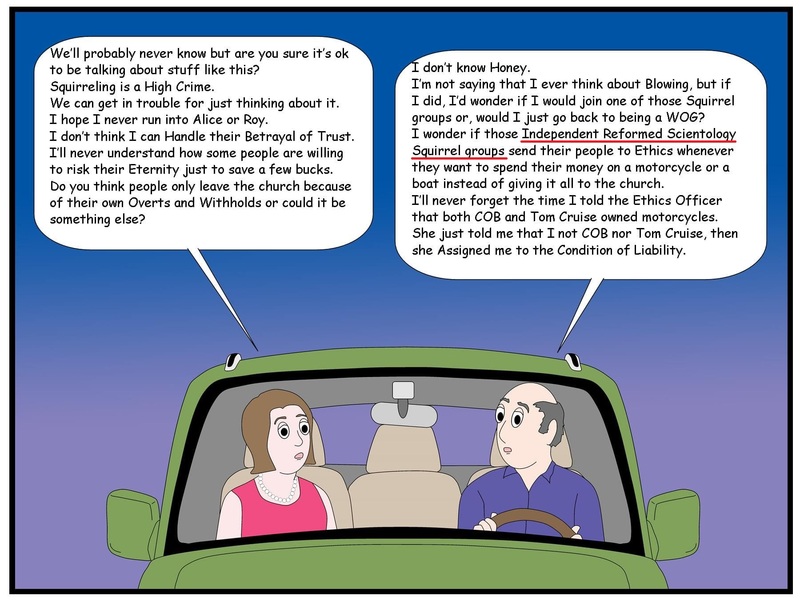 This week's "Regraded Being" comic on Mike Rinder's blog refers to "Independent Reformed Scientology Squirrel groups." The International Freezone Association operating as The Association of Professional Independent Scientologists: A change has come. 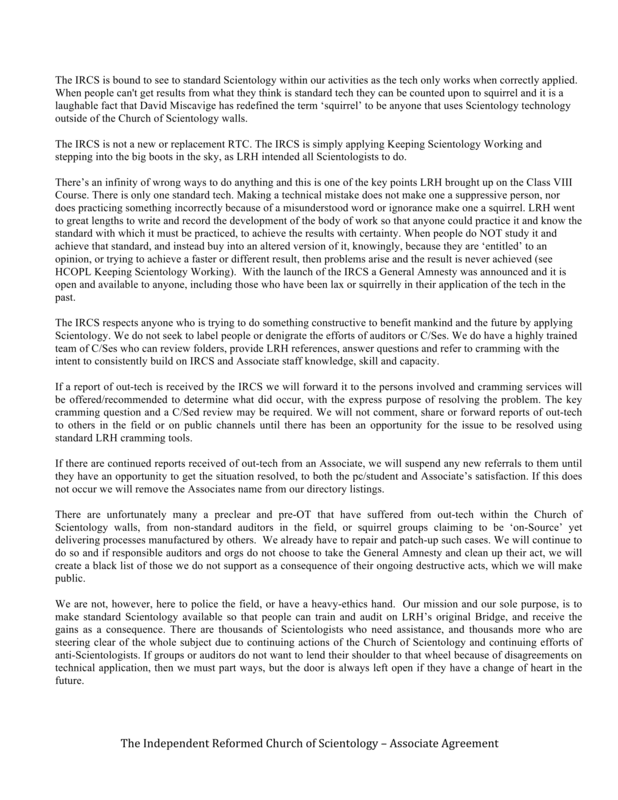 ANNOUNCEMENT: L.Ron Hubbard's philosophy and legacy can now be found in the friendly environment of the new Independent Reformed Church of Scientology (IRCS). The new church is wholly independent of the Religious Technology Center (RTC), Church of Scientology International (CSI), and the Church of Spiritual Trust (CST) (collectively and loosely known as the Church of Scientology). 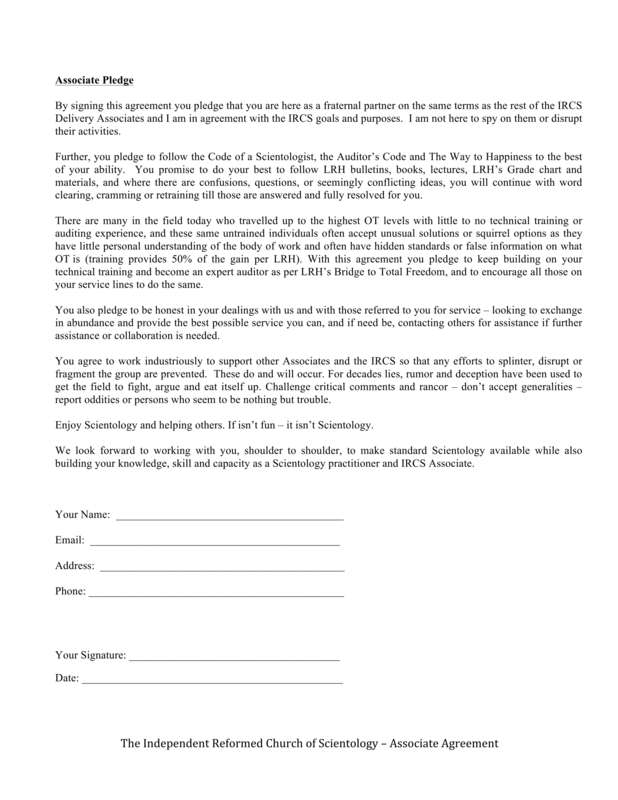 The new global church is for Scientologists who believe in and practice LRH's original philosophy and working technology and have either left the church of their own accord or been expelled from the church. It is for individuals who are seeking spiritual enlightenment through the religious beliefs and practices of the original philosophy and the technology relating to that philosophy, as originally expounded by L.Ron Hubbard, and who have no desire to be a part of the current Church of Scientology. We believe that man is free to follow his own path. His or her religious practices and beliefs are not constricted by any copyright monopoly, therefore people wishing to seek enlightenment through the practices of Scientology are not bound by law to attend only the official church (any more than Christians being bound by law to attend only Catholic churches, or Judaists bound to be Orthodox). Details on the new church can be found at Independent Reformed Church of Scientology. A change has come. We are pretty excited about it! So IFAP have joined up. Not unexpected. I wonder what will happen when if the cult wins the ongoing legal battle over the trademarks. They seem genuinely exhilarated about their new org board, their new grade chart and their new intention to really get in Ron's Standard Tech. 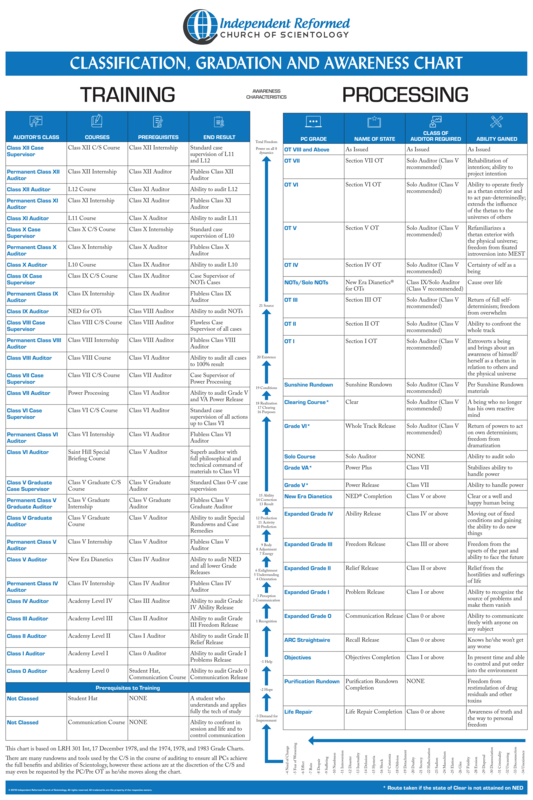 The grade chart has returned to the "old OT VI" with a claimed EP of a being who can operate exterior. They are genuinely exhilarated about being able to deliver the state of exterior too! Problem is, none of the above means anything, because they can't deliver anything they are promising. This is not only a bad wholetrack "rewind" of Scientology from the old days, but it's worse. At least "then" it was new. Now, they are genuinely exhilarated about their "stuck picture" of the late 1960s/early 70's Scientology. Being "stuck down the track" doesn't sound OT for some odd reason. Hey, I heard that you can drop what you're doing and join the RV Org, which is the new hip thing to do in the IRCofS. They are the most dedicated, ethical folks on the planet, and with their new fleet of RV's, they can run away, I mean they can be Fabian and evade the authorities, I mean keep the SPs at bay. It looks just like modern day Scientology with Ideal Orgs and all. They use the same tech that created Scientology and they expect a different outcome.